Forget the billboards! Internet marketing is now one of the most (if not the most) important form of marketing and the most cost effective. Facebook reaches billions of people, Instagram proved it can bring more customers than ever and Snapchat is now becoming strong in the market. With more and more marketers turning towards social media it becomes harder to stand out among the flood of ads and content that each user receives. Your headline is your passport in the world of social media so that's where you should put all your focus, while "Standing out" in social media terms corresponds to "going viral" which needs shareable content to keep jumping from one page to another. That's when your consumers become your own marketers. The pioneering online payment gateway Payfort created an infographic that explains how to make your content more shareable. 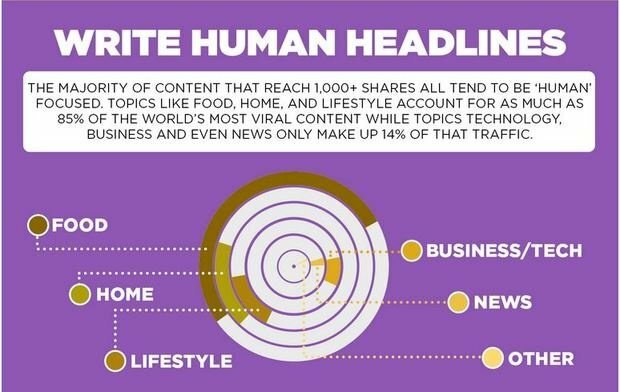 As in journalism, human interest stories are the most popular. Payfort states that headlines about food, home and lifestyle makes up 85% of the world's shareable content while only 14% of headlines about Technology, Business and even news go viral. The more emotional your headline is the more guaranteed shares you will get. Emotional headlines are catchy and easy to relate to by a wide range of audience. The best lists are the ones that has an interesting question as the headline and easy to find answers in the body. You have to understand that not all content can go viral, you need to prepare for steady traffic. Maybe only 1% of your posts will pass the 1,000+ shares mark.